At the Chateau Lacombe on November 20 at 11:55 a.m., before we start our PD session at noon, we are holding a Special General Meeting. As per Article 12 of CPRS Bylaws, we will vote on an amendment to article 10.3: quorum for the general meeting. A motion has been made to change the quorum requirement to 10 per cent, from 20 per cent of members in good standing. Motion: A quorum for any general meeting of the Edmonton Society shall consist of not less than 10 per cent of the members in good standing. 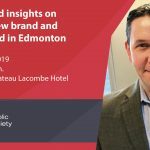 If you are unable to attend, please submit your proxy by email to Peter Haight, Secretary, CPRS Edmonton.